Blocky, uniform fruits keep their medium green color; hold their crunch during processing. Nicely crisp for fresh use—superb in salads. Ready quickly—one of the earliest picklers on the market. Gynoecious (all-female) vines ensure abundant crops. Pollinator seed included. 50 DAYS. Depth: Sow seed 1/2 inch deep with 4 - 5 seeds per hill, (thin to 2 plants per hill once it has emerged). Soil Requirements: Fertile, well-drained, sandy loam soil enriched with compost or rotted manure. Seed Count: Approximately 50 seeds per packet, 1/2 oz. is approximately 500 seeds, 2 ozs. is approximately 2,000 seeds. Pollinator: All female plants with pollinator seed included. 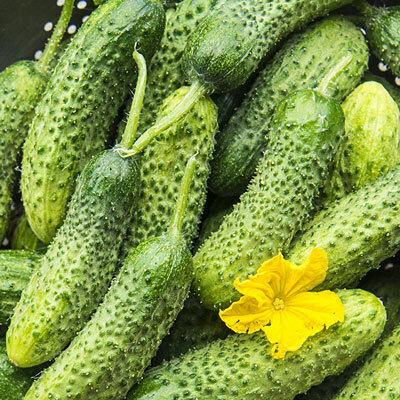 If only planting a few seeds, it would be best to plant another variety such as the Straight Eight Cucumber to assure good pollination.